Chopping it up like only he can, Tech’s versatility comes in handy when flowing over the varying production. Tech’s stop and go delivery adds a sickeningly addictive element to each verse. 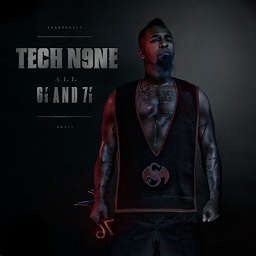 Twisting words and bending syllables to his liking, Tech N9ne’s flow grows to epic proportions. Tech has every reason to feel like a titan on “He’s A Mental Giant”. Click here to pre-order All 6’s And 7’s featuring “Worldwide Choppers” and “He’s A Mental Giant”. “Worldwide Choppers” and “He’s Mental Giant” were produced by Michael “Seven” Summers.